In the tradition of making ballparks more millennial friendly, the Yankees ripped out a bunch of seats for the 2017 season and created several new standing room options. This is in addition to the assigned standing room areas that already existed in the ballpark, so Yankee Stadium is now a much nicer place to wander around in after buying a cheap ticket. You can now get a “Pinstripe Pass” standing room ticket, which is a very inexpensive ticket with your first beer or Pepsi product included. At ballpark prices, that’s almost like getting into the ballpark for free. Yankee Stadium Standing Room Tip #1: Field Level. The reserved standing room tickets on the field level aren’t as bad a deal as you might think looking at the price (you can’t access this with a Pinstripe Pass). There are barstools and counters, and in most spots you have a pretty nice view of the field and scoreboard. 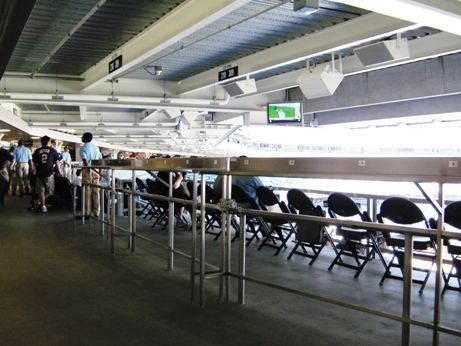 The Yankees call is “café seating”, and it’s restricted to ticket holders. Nice and shaded, and easy to run for a beer or garlic fries from your spot. Showing the last year you were able to get a Yankees ticket this cheap. Yankee Stadium Standing Room Tip #2: Outfield Areas. 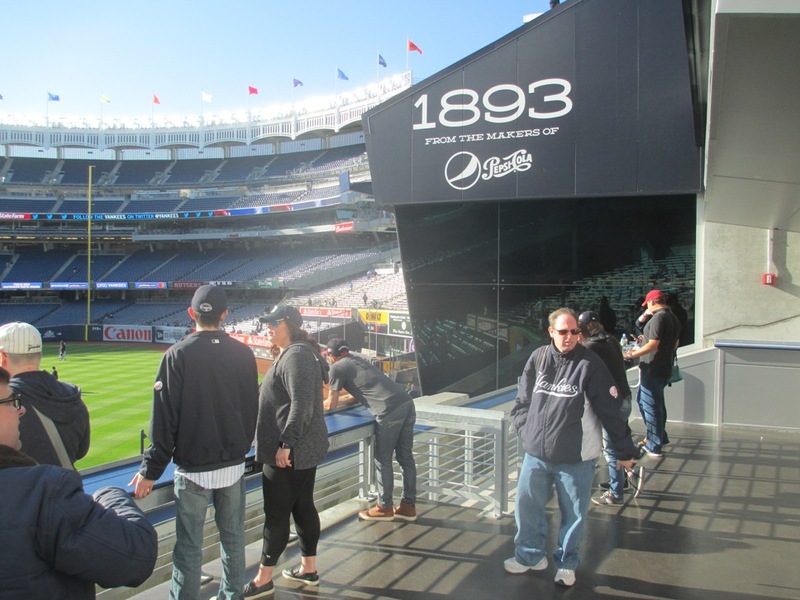 The Yankees tore out the bleachers sections with obstructed views…a smart move given that fans lost half the view of the field there…and these are now standing room areas with their own bar, drink rails, and barstool seats. You even have some specialty food and craft beer options with the money you’ve saved on your cheap ticket. The best part is that these areas are close to the bullpens (the visitors bullpen is in left field), making it a great place to offer some friendly encouragement. Anyone have a four-foot stool? Yankee Stadium Standing Room Tip #3: Avoid The Terrace Level SRO. I don’t know if the Yankees sell standing room tickets that are designated for the Terrace level anymore, but just get a Pinstripe Pass instead and stake out a better spot. The Terrace standing areas are behind the handicapped seating, which is almost always occupied, and you need to be about 11 feet tall if you want a decent view of the infield. You’ll probably dislike the view enough to move. 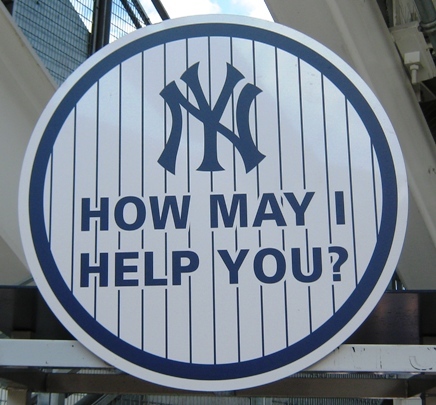 There’s three Yankee Stadium standing room tips for you…click here for more cheap seating options. 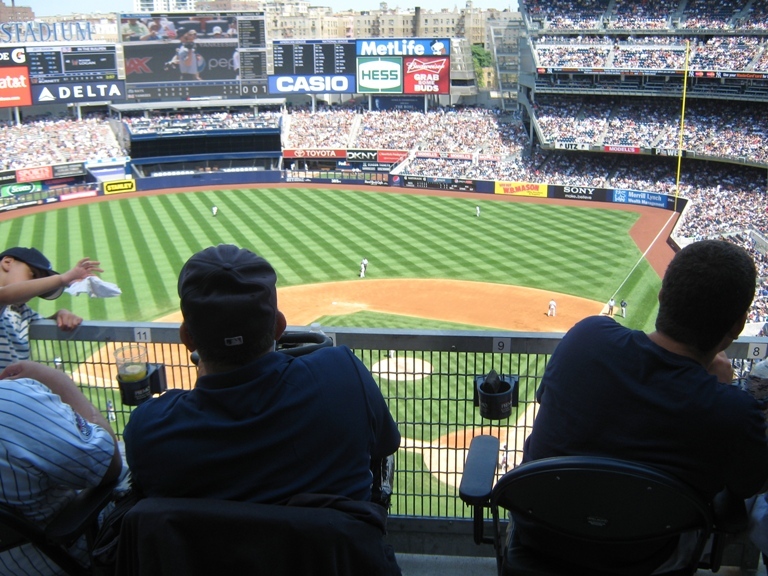 Remember Yankee Stadium has open concourses, so should your spot not be everything you dreamed of, there are plenty of places to view the game from your feet.